Welcome to chaos. 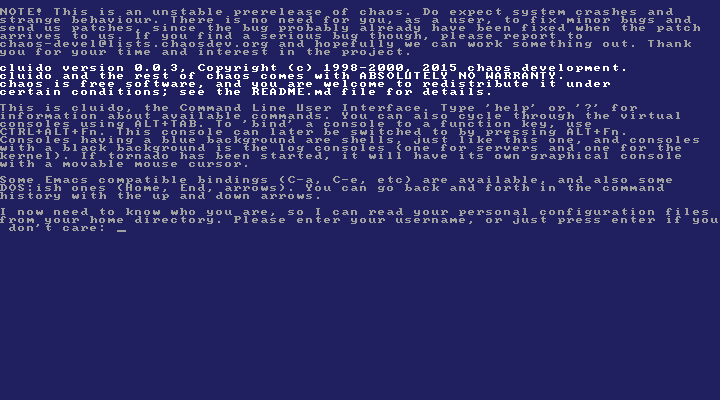 chaos is an operating system developed around the year 2000 for the x86 platform (also referred to as “ia32” in the codebase). Naturally, given the hobbyist nature of the project, none of the features just mentioned is “complete” in the sense that it supports all features of the PCI bus, or all features of UDP, ICMP etc. Nonetheless, the system was at an earlier point stable to the point where it possible to e.g. use it for network bridging - you could run e.g. ssh “through” a machine running chaos. It would also reply to ICMP echo (i.e. “ping”) packets, as well as support outgoing ping packets to other machines. Having that said, there are a number of issues with the codebase which made us start the development of the new stormG3 kernel (which would replace the existing storm “G1” kernel.) There was also a stormG2 project being undertaken but it was abandoned before being completed). The most critical issue with stormG1 is that the kernel leaks memory; the number of free pages decrease gradually over time. Because of this and the general feeling that the system would benefit from a major refactoring (hey, isn’t it always fun to rewrite your code, trying to get things better done the second time? :wink:) the storm G3 project was initiated, where we attempted to Do Things Right™ to a greater point than had been earlier done. Like many hobby/spare-time projects, the project was never finished and storm G3 is therefore currently in a very unfinished state. Nonetheless, feel free to check it out if you like. Note: If you just want to try things out, go straight to the Releases page and download an .iso file. Then, skip down to “Running chaos” below. Linux, Mac OSX or Windows. Vagrant. If you don’t know what this is, go check out their web page. It makes things like this much easier and smoother. Fork the repo (using the Fork button in the upper right). Clone your fork (using the clone button here at GitHub or straight in the command line). After you have done vagrant ssh, you should now have a Linux session to your chaos development environment. It is a Linux machine, fully separated from your host system (be it Mac OS X, Windows or event Linux itself, but in the latter case you might as well run all of this on the host instead). You should now be in the /vagrant folder with easy access to the chaos source code residing on your host machine. Type the following commands to perform the compilation. Fire up your favorite VM software (VirtualBox, Parallels, VMware Player/Fusion, etc. Even Virtual PC will probably do). Create a tiny VM (256 megs of RAM will do, no hard drive etc) with the chaos.iso (or chaos-0.0.x.iso if you downloaded it from here) file as the CD drive. From there, just follow the instructions on the screen. This is an incomplete list of the authors of the chaos operating system, sorted alphabetically on last name. If you feel your name should be on this list but you aren’t - please let us know. storm/ia32/cpuid.c (should be rewritten so the whole kernel can be used under the BSD license). We encourage code that is written for chaos (servers, programs, libraries) to use the license below. This license allows us, and anyone else for that matter, to use your code freely, incorporate it in future versions of chaos and similar. However, unlike with the GNU GPL, we don’t force this choice upon you. The freedom is yours. Use it wisely. Copyright © 1999-2000, 2006-2007, 2013, 2015-2017 chaos development. Neither the name of chaos development nor the names of its contributors may be used to endorse or promote products derived from this software without specific prior written permission. THIS SOFTWARE IS PROVIDED BY THE COPYRIGHT HOLDERS AND CONTRIBUTORS ``AS IS’’ AND ANY EXPRESS OR IMPLIED WARRANTIES, INCLUDING, BUT NOT LIMITED TO, THE IMPLIED WARRANTIES OF MERCHANTABILITY AND FITNESS FOR A PARTICULAR PURPOSE ARE DISCLAIMED. IN NO EVENT SHALL THE COPYRIGHT HOLDERS OR CONTRIBUTORS BE LIABLE FOR ANY DIRECT, INDIRECT, INCIDENTAL, SPECIAL, EXEMPLARY, OR CONSEQUENTIAL DAMAGES (INCLUDING, BUT NOT LIMITED TO, PROCUREMENT OF SUBSTITUTE GOODS OR SERVICES; LOSS OF USE, DATA, OR PROFITS; OR BUSINESS INTERRUPTION) HOWEVER CAUSED AND ON ANY THEORY OF LIABILITY, WHETHER IN CONTRACT, STRICT LIABILITY, OR TORT (INCLUDING NEGLIGENCE OR OTHERWISE) ARISING IN ANY WAY OUT OF THE USE OF THIS SOFTWARE, EVEN IF ADVISED OF THE POSSIBILITY OF SUCH DAMAGE. © Copyright chaos development 1999-2017. All rights reserved.